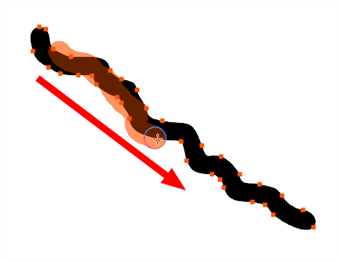 You can use the Smooth Editor to smooth out specific areas of your drawing strokes. In the Tools toolbar, select the Smooth Editor tool or select Drawing > Tools > Smooth Editor. In the Camera or Drawing view, place your pointer over the lines to smooth. You may need to pass over the same line several times to remove more points and make the line smoother. Note that by default, the Smooth Editor tool colour is yellow, it was changed to orange for screen grab clarity—see Smooth Editor Tool Properties to learn about the various settings available.